1. The first thing you will want to do is determine whether the mark is a scratch or not. Try to rub it out with a soft rag or terrycloth rag. You can apply a mixture of water and vinegar to the marked area and rub the scratch. If it comes out, then it wasn't a scratch in the first place. 2. If you have determined that you have a scratch, now you will want to determine if the scratch is only on the finishing agent at the floor surface or has actually penetrated to the wood itself. Superficial scratches can be remedied by applying a small amount of the original finish back to the scratched area. Use a very fine steel wool 00 grade, or sandpaper to lightly rub the edges of the scratch. This will rough up the area so the new finish can stick more easily to the scratch. 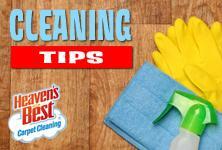 Clean the area of dust as well as possible to ensure the cleanest looking finish. Use the same finishing agent to repair the scratch. 3. Use water-based color matching filler on deeper scratches. Press the filler into the scratch and allow it to dry thoroughly. Be sure to follow the wood filler instructions exactly, to ensure that you get the best performance out of it. 4. Sand the wood filler smooth with 400 grit sandpaper, and apply a surface finish with a brush over the top. The color matched filler and the finish over the top will leave the floor scratch virtually invisible. If you have determined that the scratch wasn’t a scratch at all and you have several areas that need attention, then a professional cleaning and conditioning might just do the trick. 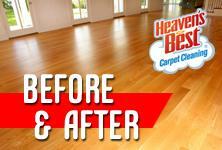 Here at Heaven’s Best Carpet Cleaning, we service your fine hardwood floors with a unique and proprietary cleaning agent that has been formulated to clean, condition, and protect all types of hardwood and laminate floors. This protection along with regular professional cleaning will extend the life and improve the appearance of your hardwood floors. We would be happy to help you get them looking like they did the day they were installed. Give us a call if you are in need of some maintenance and hardwood floor repairs in Birmingham, AL at 205-618-9150.